Hopefully many of you out there will have had a great Christmas, andÂ receivedÂ this fantastic phone from a loved one! Or more likely, treated yourself to something nice...! :P I've gathered some of the best tips for features and functionality you might not have realised existed within the Galaxy Nexus. A lot of these tips are actually Ice Cream Sandwich, rather than the phone, so if you have another phone with Ice Cream Sandwich installed, you should also have a look through too, you might learn something new! This is part one of this post, there are plenty more tips to come! Ok, so you probably know about this feature already, but there is a lot of confusion about exactly what happens in the background when this is used. Well, that's all about to be cleared up! Anywhere within ICS you can press the multitasking button to view a list of the 15 most recently used apps. A nice preview of the last state of the window is given, as well as the name of the app. You can slide an app in this list left or right to remove the app from the list. It's great for managing apps you don't use that much and just want to hide away. But what many people don't know is what exactly this swiping action does in terms of the app itself. Well, let's have a look shall we! The easiest way to describe what happens would be to say that swiping an app off the multitasking list is effectively the same as pressing back when inside the app in question, until you are returned to your homescreen. Effectively the swipe loops through all open activities associated with the app and calls the android method of finish(), asking the activity to finish. Now this generally means that the app will be closed, but not so if an activity is still in the foreground,Â a prime example being an app where music is currently playing. This is something many of us have been doing for a while with 3rd party launcher apps. Resizing widgets to either fit them into a smaller space, or increasing their size in order to display more information at the same time (There is also the additional use, ensuring the widget is displayed using the original dimensions when we add additional columns and rows to a custom launcher). 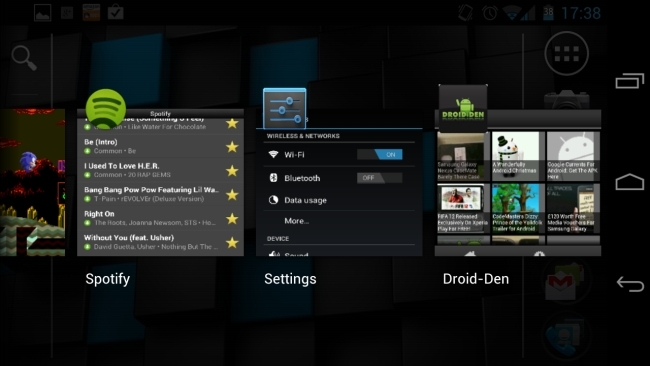 Ice Cream Sandwich, like Honeycomb before it, lets you resize certain widgets. 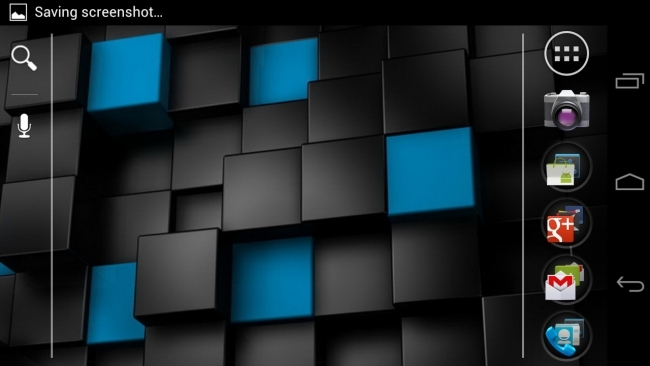 However, this is currently limited to the stock widgets that come as part of ice cream sandwich. There are ways of expanding this to all widgets however, most notably via the use of a customised stock launcher such as Nova Launcher. One of my personal wishes was for the ability to remove individual notifications from the notification bar. We've had this for a while in custom roms such as CM7, and now we have it in stock android thanks to ICS. You can swipe left or right to remove individual notifications from your notification bar, of course you can still press the x to clear everything at once. I'd love to see the notifications functionalityÂ enhancedÂ in future versions of android. For example swiping anÂ individualÂ notification left to mark the item as read in the respective application, swipe right to delete the item you are being notified about, and maybe long press to remove the notification. The rendering within a window pre-ICS was all performed by the CPU (windows animations were done by the GPU, but that's a different story all together). 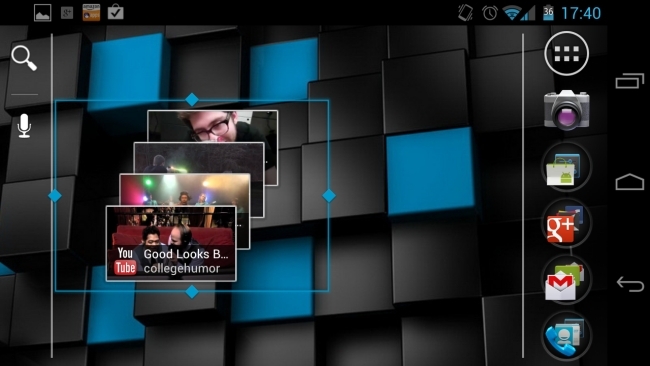 This changed with the introduction of Honeycomb and now with ICS. 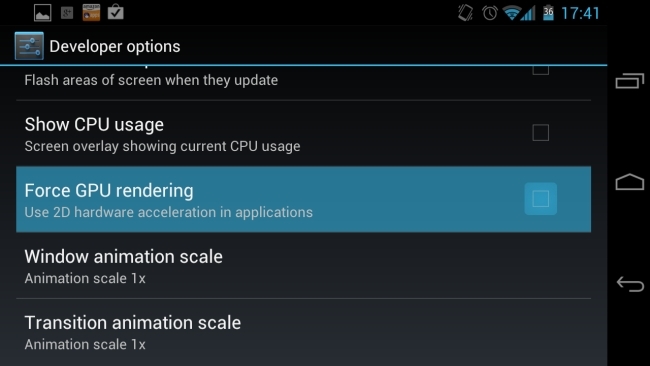 ICS automatically turns on GPU rendering for all apps that areÂ targetingÂ to API level 14 (API level 14 is android 4.0, the base version of ICS). This is great, but means that the GPU isn't utilised for apps that don't specifically target ICS (which at the time of writing is quite a few!). This option available within the Developer Options settings effectively turns on GPU rendering for allÂ applications, regardless if they specifically target ICS or not. This can be great news, as offloading rendering to the GPU typically leads to a smoother UI experience, especially within apps that handle lots of information such as the official twitter app. However, there are some disadvantages to enabling this option that you should be aware of. It may cause some UI issues within certain apps and games. For example the menu bar within AstroÂ just doesn't appearÂ when GPU forced rendering is enabled. My advice would be to try turning this on and see if you notice a difference in the smoothness of any apps. If not, revert back and forget about it, but if so, bear in mind that any graphical glitches in apps you see may be caused by this, and to see if disabling it fixes the issue before reporting it as a bug to the app developer. Simple, and easy. A great feature that had already been implemented by many android manufacturers, butÂ noticeablyÂ missing from stock android. Simply press the volume down key and the power button at the same time to take a screenshot of the current screen. 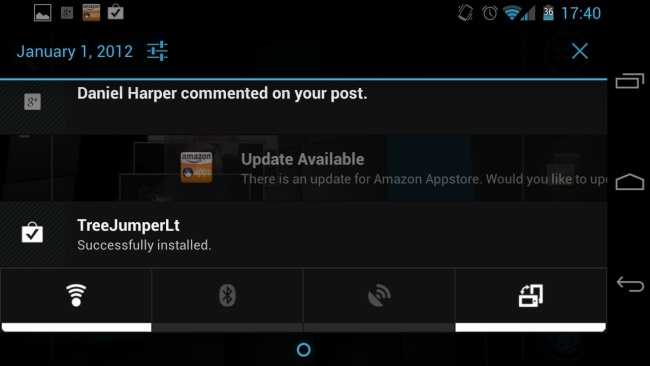 A notification will then appear allowing you to jump straight to the new screenshot and share as you wish. That's it for part one! I hope an explanation of some of the more apparent features of ICS was helpful, remember to stay tuned for part 2 which will cover some of the more obscure features of ICS andÂ theÂ SamsungÂ Galaxy Nexus!